SPEND THE WINTER IN MARBELLA! DISCOUNTS FOR BOOKINGS of 2+ WEEKS: £100 discount per week for direct bookings of 2 weeks or more. DISCOUNT FOR BOOKINGS OF 5 DAYS: Minimum booking is 1 week but I am now offering 5 days with £100 discount on the weekly rate, not applicable in July and August. Camojan Blanco is a delightful development located in the exclusive area of the Sierra Blanca, known as the 'Beverly Hills' of fashionable Marbella. Superbly situated 190 metres above sea level, the house has panoramic views of the Mediterranean and African coastline, Marbella and the mountains of the Sierra Blanca. A peaceful residential area yet within Marbella's famous 'Golden Mile' and just a few minutes from Marbella town centre and the sea. Also the Monte Paraiso Country Club & Golf Course is within walking distance! For discounts on last minute bookings throughout the year please contact. Personal Service: We look after you! No need to worry about finding the house or going shopping immediately. On your arrival if you have car hire we can provide you with directions or a private taxi can be arranged to collect you and take you to the house where there will be a welcome food package waiting for you. Alternatively there is an excellent Airport Bus service from Malaga Airport, details on request. There is an 'Information pack' in the house which has details of restaurants, shops, beaches, night-life, places to visit and other helpful tips. Marbella & Puerto Banus: Marbella town centre, supermarkets and the beach are all within a 5 minute drive. Famous Puerto Banus with its shops, restaurants and glittering night life is a 10 minute drive. You can also reach San Pedro in 15 minutes, Malaga airport in 35 minutes and Ronda and Gibraltar in 45 minutes. Within 2½ hours you can enjoy excellent snow-skiing at Sierra Nevada or visit Cordoba, Seville or Granada. Sailing and all water sports are available and there are many excellent tennis clubs, health and gym centres in the area. There are also of course superb golf facilities very close by. Booking Terms & Cancellations: Non refundable booking deposit of 25% of total cost to be paid to confirm reservation. Balance to be paid in full 8 wks prior to arrival. Bookings less than 8 wks to arrival full payment required. Signed indemnity against damage & £500 bond to be paid with balance of total holiday cost. Bond returned after departure providing no damage to property, property contents or car. Any damage over £500 will be charged in addition to bond. Cancellations: Charges apply for cancellations within 8 week period before arrival date as a percentage of entire holiday cost. Between 8 and 6 wks: 30%. Between 6 and 4 wks: 45%. Between 4 and 2 wks: 60%. Between 2 wks and arrival date: 100%. Adequate holiday insurance is strongly recommended. ALL INCLUSIVE RATES INCORPORATING: Welcome food parcel; linen; towels & weekly maid service. Minimum booking charge 1 week with pro rata rates for additional nights. For further info, quotations & last minute availability please contact me. Hoping to one day live in this wonderful house full time. In the meantime I'm a travelling cleaner! Yes, I fly back and forth from the UK to prepare and clean the house ready for my guests whom I also meet and show around the house before I fly home again! Sounds mad I know but it actually works very well. The house is well looked after and I get some sunshine! Having had 4 children in 6 years we just wanted relaxed holidays. I was lucky enough to spend all the Easter and Summer holidays in Marbella with the children and my husband travelled back and forth. The kids had the most wonderful relaxed and carefree summers and the house holds a special place in all our hearts. Location location location! The location, the pool, the layout and the view are the best things about this house. It's so well located. Just 5 minutes from the beach and the centre of Marbella but in a quiet residential area so you get the best of both worlds. Peace and quiet but with all the benefits of Marbella and Puerto Banus on your doorstep. The pool is fabulous, lagoon / beach style so you can walk into it or just have a paddle, great for children learning to swim. The layout is great, especially if there are 2 families or grandparents. The accommodation is on 3 floors, each bedroom has an ensuite bathroom and there are 3 terraces, 2 of which belong to 2 of the bedrooms. So you all have somewhere to escape to instead of being on top of one another. Finally the view, I never tire of it. The master bedroom is on the top floor and the large private terrace has fabulous views of Marbella and the coastline. It's so wonderful to have that outside space off your bedroom, to sleep with the windows open and take in the view first thing in the morning and the stars at night, I love it! The Master suite bathroom has a large round bath overlooking the terrace. On the Master terrace there is also a simple outdoor shower, perfect to cool off when sunbathing. Lots of crockery, utensils, serving dishes etc. The kitchen is fully equipped & I mean fully equipped! It's very much home from home with everything you could need including a sandwich toaster, deep fat fryer, electric whisk, electric blender etc. Camojan Blanco is superbly located within the Golden Mile yet in a quiet residential area in the exclusive Sierra Blanca. 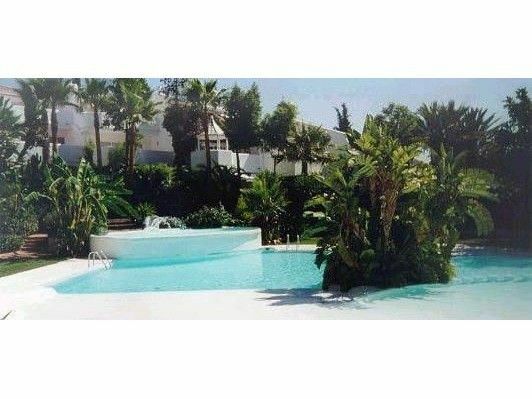 Just 2 km, 5 minutes by car to the centre of Marbella & the nearest beach & 10 minutes to Puerto Banus. Also the new Monte Paraiso Country Club & Golf Course is within walking distance! Conveniently there is a new El Corte Inglés store at the bottom of the road so you can soon nip out quickly to pick up some essentials. This is an upmarket department store selling everything from Garden Furniture to Kitchens but it also includes a Perfumería & Cosmética, a large Supermarket & a super little Delicatessen that's like a mini Harrods Food Hall! There's a Cafeteria on the top floor....great for breakfast. Above Marbella & about 10 minutes from the house there is also a commercial centre called La Cañada where you will find all the well known High Street shops, a huge Supermarket & a Cinema. Everything you might need can be found just a few minutes away. * * TIP: There is the new Monte Paraiso Country Club within half a mile of the house. The Country Club includes a 9 Hole, Par 3 Golf Course, designed by Manual Piñero of Ryder Cup Fame.